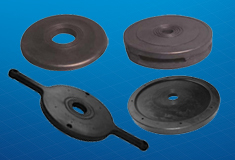 Pipe wiper rubbers are designed to remove fluids and debris from the pipe when it is being run or pulled. Wiper rubbers can also prevent foreign objects from entering the well bore by covering the annulus between the tubing and casing. Our wiper rubbers are offered in natural rubber (standard) and Nitrile rubber compounds. Remove fluids and debris from pipe. Reduces fluid spillage on rig floor. Steel ring molded in place for added support. © Oil States Industries, Inc. All Rights Reserved. Terms & Conditions and Legal Disclosures .